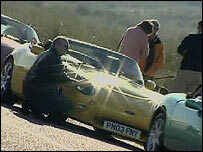 The troubled sports car firm TVR has been sold back to its previous owner, sparking anger among union officials. The Blackpool-based company went into administration just before Christmas, leaving the future of the plans and almost 300 workers' jobs in doubt. Nikolai Smolenski bought the firm from the administrators after making the highest bid, it emerged on Thursday. The Transport and General Workers Union (TGWU) said it was absurd the Russian tycoon was allowed to buy it back. Andy Robertson, the union's regional organiser, said: "If this means that manufacturing is taken out of Blackpool it will be a disaster for the area. "It is absurd that the previous owner, who allowed it to go into administration, is now once again the owner. "The government should not allow this practice to take place. "The workforce will be extremely angry and disappointed that Mr Smolenski has been able to walk away unscathed while they have suffered so much." The workforce at Blackpool Automotive, TVR's manufacturing arm, were given redundancy notices just after Christmas. The move followed the company's decision to switch in-house production of its high-performance cars abroad. TGWU officials said the Department of Trade and Industry had paid out redundancy and notice pay, and pensions were still being looked into. Administrators revealed on Thursday night that they had sold Blackpool Automotive to a company controlled by Mr Smolenski. The sale includes the TVR trademarks, vehicle stock, and the manufacturing plant and equipment. In a statement, joint administrators Philip Long, Kerry Bailey and Matthew Gibson said they were confident they had achieved "the best possible price in the circumstances". They said a significant number of companies had expressed and interest in Blackpool Automotive and four demonstrated they had the funds. "Ultimately, Mr Smolenski's company came in with the highest offer," the statement said. 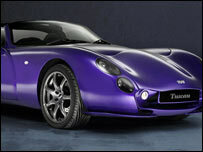 Established in 1947, TVR is Britain's largest independent sports carmaker. It was founded by Trevor Wilkinson, who used three consonants from his first name for the company title. It was first bought by young tycoon Mr Smolenski in 2004.